Who doesn’t love the classic combination of peanut butter and chocolate? Have you ever met anyone who didn’t? 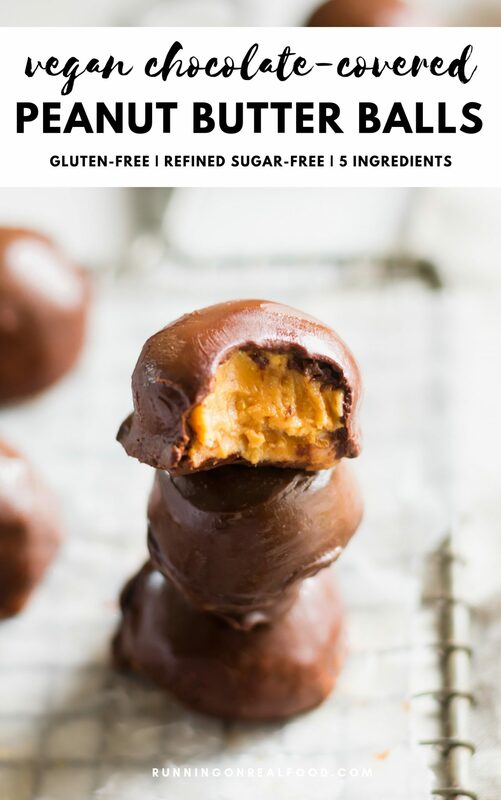 It’s a delicious match made in sweet, sweet peanut butter heaven and this vegan chocolate covered peanut butter balls recipe is the perfect way to pair the two. 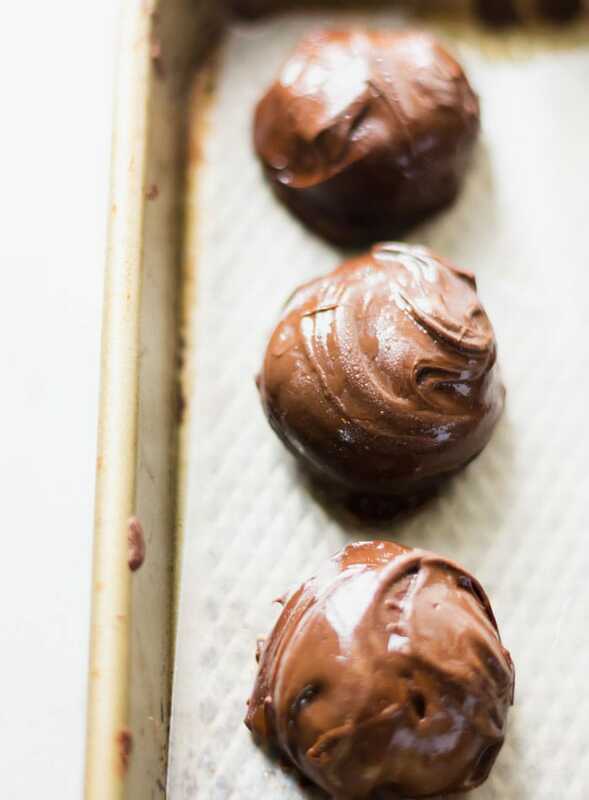 Traditional peanut butter balls are made with a ton of butter and powdered sugar, on the other hand, these sweet little balls dipped in chocolate have no refined sugar. Instead, they’re sweetened with just 2 tbsp of maple syrup and coated in rich, dark dairy-free chocolate. I also used a small amount of coconut oil and nutritional yeast for flavour and texture. The nutritional yeast actually makes them taste like a Reese Peanut Butter Cup! Yes, you heard right! A healthy Reese Peanut Butter Cup in melt-in-your-mouth vegan format. Mmmm…chocolate peanut butter balls. 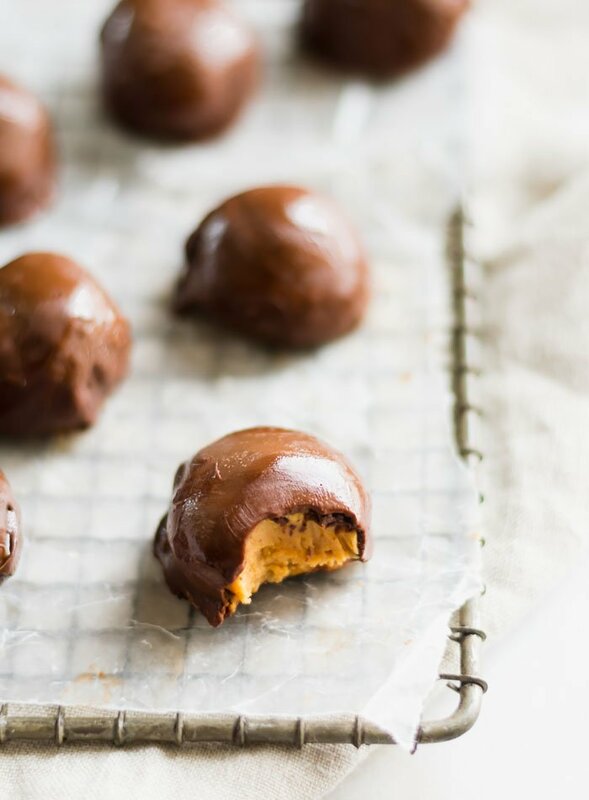 These simple vegan treats are crunchy on the outside and melt-in-your-mouth on the inside with the perfect balance of sweet and salty. To make the peanut butter filling, make sure you use natural peanut butter and not a processed variety. There are plenty of good brands in stores or you can always make your own at home. The ingredients listed should be peanuts or peanuts and salt and there should be no sugar or oil listed as an ingredient. You can also use almond butter or another nut butter of choice if you can’t do peanut butter. These are amazing with almond butter too. 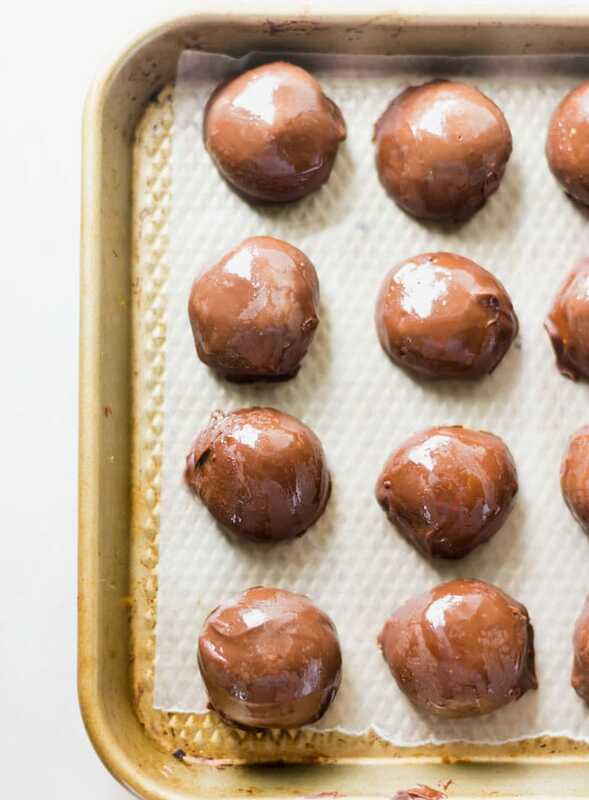 For the delicious, simple chocolate coating for these balls, you’ll want to get your hands on some quality dark chocolate or vegan chocolate chips. I like Green & Blacks Organic Dark Chocolate or Enjoy Life Chocolate Chips. 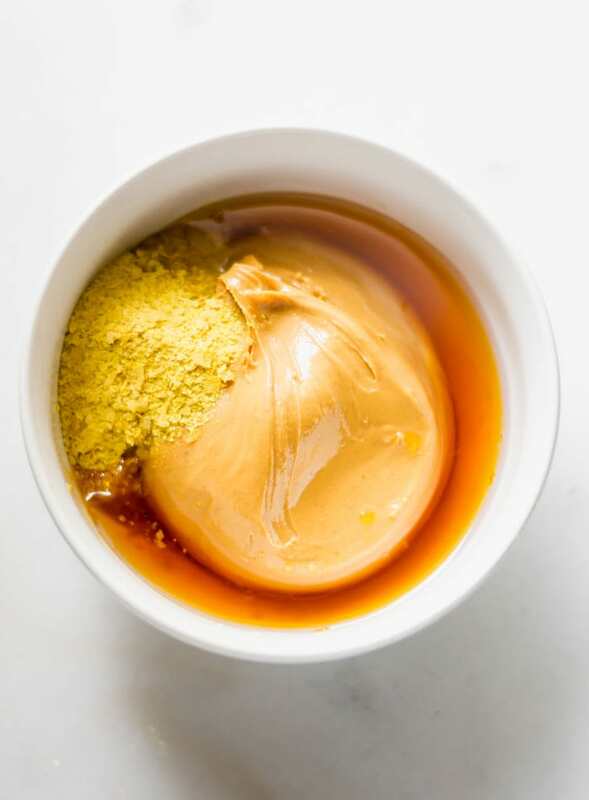 Other than the chocolate and peanut butter, you’ll just need a little maple syrup, coconut oil and nutritional yeast (not sure what nutritional yeast is? Read this post.) to finish these up. Once the balls have been dipped in chocolate and set, they’re ready to enjoy. 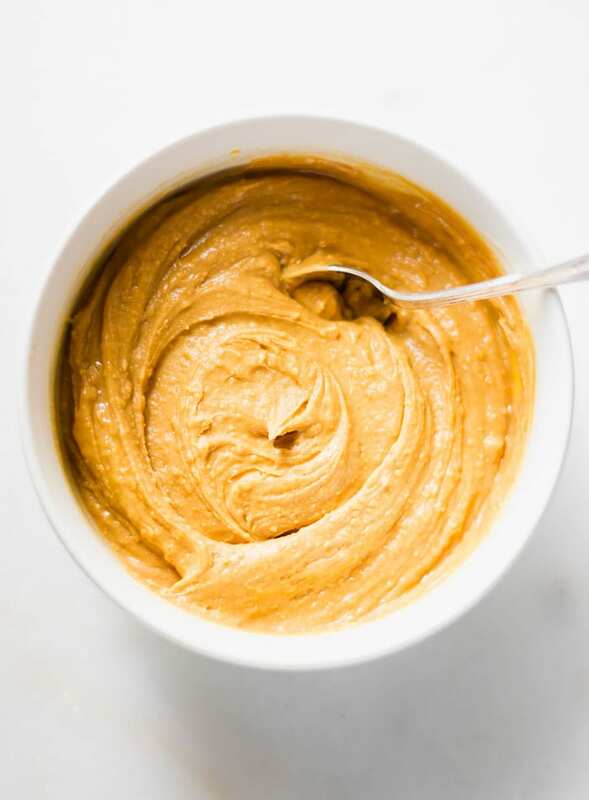 As for tools, you’ll need a mixing spoon, a medium or large mixing bowl for the peanut butter filling, a double boiler, a baking tray and some parchment paper. 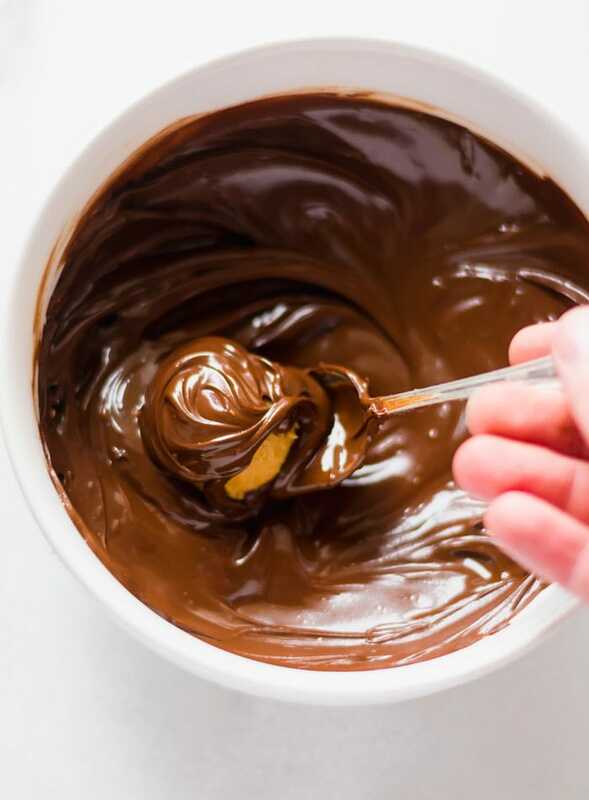 If you don’t have a double boiler, simply place a glass or metal bowl over a small pot of boiling water, place the chocolate in the bowl and stir until smooth and melted. The chocolate can also be melted in the microwave 10-30 seconds at a time, mixing in between, until smooth and creamy. 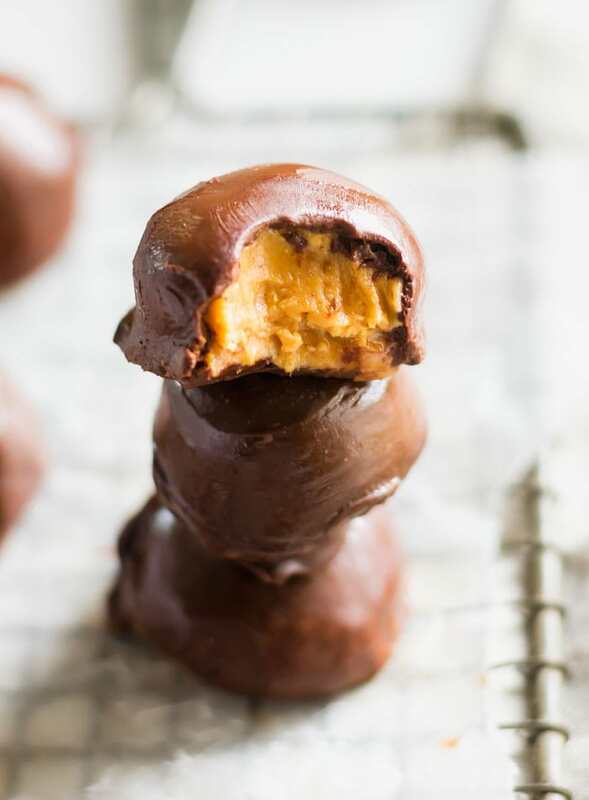 These delicious chocolate-covered PB balls taste like Reese’s Peanut Butter cups. These are very easy to make and are always a hit with everyone who tries them. If you can’t do peanut butter, go ahead and use almond butter or another nut or seed butter of choice. Vigorously mix together everything except the chocolate in a large bowl for about 60 seconds. It should begin to thicken up a little. Place the bowl in the freezer until it firms up enough to roll into balls. Approximately 20 minutes. 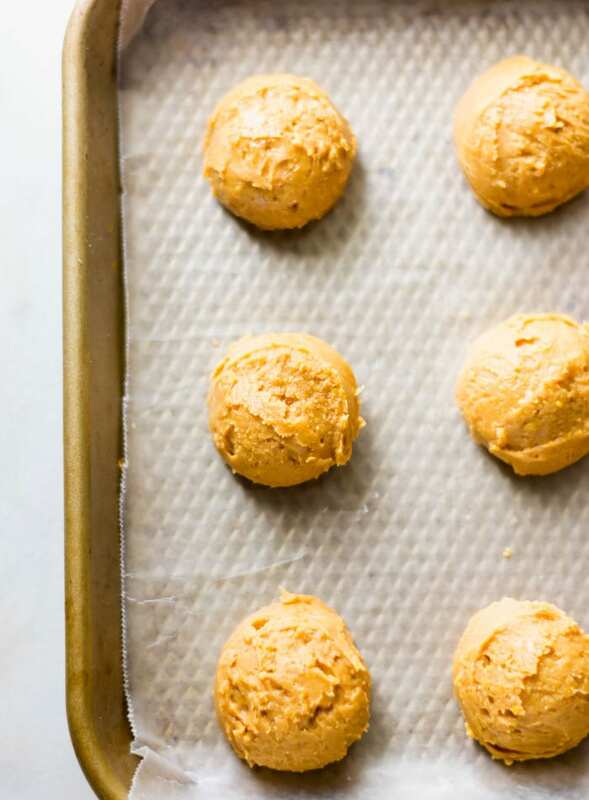 Once it’s ready, roll the peanut butter mixture into 18-20 approximately 1.5 inch balls and place back in the freezer. Melt the dark chocolate or chocolate chips in a double boiler or bowl placed over a pot of boiling water. 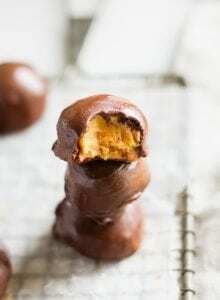 Once the chocolate is totally melted, roll each peanut butter ball in the melted chocolate using a fork or toothpick until it’s completely covered. Tap any excess chocolate off on the side of the bowl before placing on the cookie sheet. Once you’ve covered them all, place in the freezer to set for at least 30 minutes. They will melt at room temperature, so store in the fridge or freezer until you’re ready to eat. K I seriously need to move in and just devour all of your food! Even if you hide all the goodies under kale I will still find them. My “to-make” list is actually half of your recipes. haha yes I’m travelling but you know that 🙂 thank you again friend! You’re more than welcome to move in and help me eat all these treats so I don’t eat them all!! Haha. If I balance them out with kale, it’s totally fine though, right? I wanted to make these today and save for a Christmas eve treat. How long would you say they can they be stored in the fridge or freezer? They should be a-ok for at least a week 🙂 Mine didn’t last that long but it should be no problem. I would say 1-2 weeks in the fridge and up to 3 months in the freezer in a sealed container. Hi Lori, I use a flaked nutritional yeast. I usually buy Hoosier Farms but there are lots of other good brands on Amazon and in stores. I’ve used Bragg’s and Bob’s Red Mill before too and they’re both good. Enjoy these! Ooh I love these so much! Just made my third batch, Some for my best friends birthday tomorrow too. That is so amazing to hear!! I’m so glad you’ve been enjoying them. Hi! I think honey or agave should both work ok 🙂 Enjoy! Hi Deryn! Do you have the macro counts for this and the Vegan Peanut Butter Cups? If so, I’d love to have them. Thanks! I’m sorry I don’t. These recipes are quite a few years old recipes and I didn’t calculate anything back them. If I re-make them I will add it in. Let me know if you end up calculating it. These peanut butter balls look so decadent and delicious! Such a great easy snack! Ya! They’re the best. So easy to make too. Hope you enjoy them if you try the recipe. I wish I had one in my hand right now! They look absolutely scrumptious, and who doesn’t love the peanut butter chocolate combination! I love how I can make these and pop them into the freezer for when I’m craving my favorite combination of chocolate and peanut butter. Thanks for sharing this delicious yet healthy recipe! This delicious flavour combo never goes out of style. No matter who you prepare it, it gets devoured EVERY TIME!! Addictive and delicious, you can never go wrong with chocolate and peanut butter. I have been craving chocolate and peanut butter so it seems I have stumbled on this recipe at the perfect time! I never would have thought to use nutritional yeast. One question. I have no coconut oil and actually never have used it before–is it absolutely necessary? If so, is there a substitute? I might end up getting some. Hi Kimberly, it’s not totally necessary in this recipe but it helps the peanut butter firm up so you may struggle to roll the peanut butter into balls without it. You could try adding some coconut flour or almond flour instead though! Chocolate-covered peanut balls…looks tasty. Thanks for giving this yummy peanut balls recipe.